Physical challenges to manage finances (low vision or difficulty writing checks)? Using pay-day loans or rent-to-own? Low motivation to pay bills? Please give us a call at Alternatives, we can help! After placing a call to Alternatives, we may ask you a few questions to be sure we are connecting you with just the right resource. If Money Management is deemed a good referral, we will connect you with a Money Management Coordinator. The Coordinator will schedule a time to meet with you and together, develop a plan to meet your needs. Even if you just want to talk through a situation or make a referral for someone else, give us a call, we are here to help. 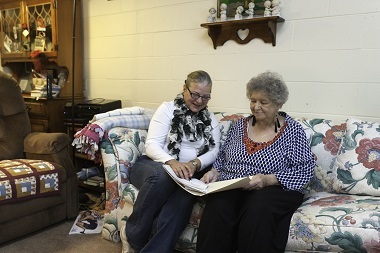 MMP is a volunteer program that matches trained and bonded volunteers with seniors who need help managing their finances. The volunteers can organize and pay bills, establish and maintain budgets, assist in applying for financial programs and assist with setting and achieving financial goals. How do I know when to ask for help? A care coordinator will talk to you to help you determine your needs. The care coordinator will make a referral to the money management program. At that point, the local money management coordinator will contact you to discuss options and set-up an appointment to visit.